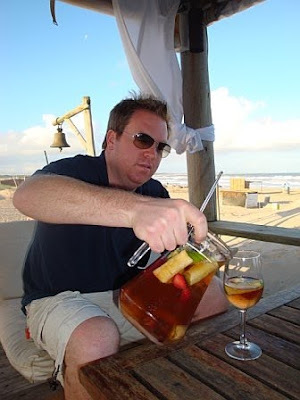 It's called Clericot (pronounced Clair-ih-co) my Jet Setter friends...and on the beaches in Punta del Este, Uruguay it is the drink of choice! Bottom line, it's very much like a white wine version of Spanish Sangria. 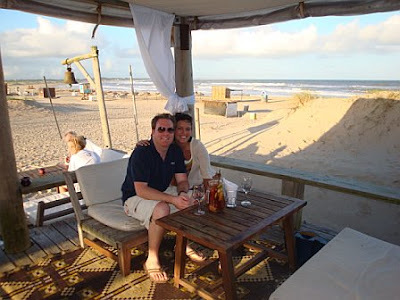 We were in Punta del Este in March and I asked one of the waiter's at La Huella (a beautiful restaurant right on Jose Ignacio Beach where the Jet Set hang out) for the recipe. 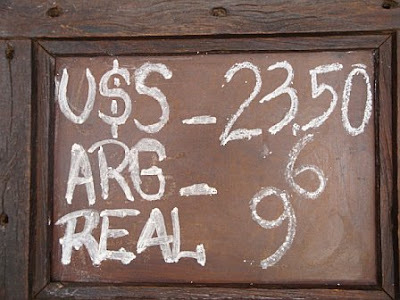 (see below) I also bought one of the pitchers they serve it in down there for the equivalent of about $3 U.S. dollars. This is why I say you can still Jet Set in this economy..you just have to Jet Set Smart to the countries where our dollar is still worth something!